After two pregnancy attempts with her own eggs, Cheryl understood that it was unlikely to have offspring that way. For her and her partner, it was hard to digest but they were not willing to give up their dream of raising a family. It was her doctor who encouraged them to visit Clinica Tambre and explore their possibilities. Cheryl says that since the first time she and her boyfriend were at Clinica Tambre they felt at home, the medical team explained them all the options they had, resolved all the doubts they had so far and gave them all the time they needed. “We were extremely impressed on how they received us,” says the interviewee. In this way, the couple began their journey towards fatherhood; a process that, like a roller coaster, had its moments of joy and its complicated situations. Although it sounds very simple, Cheryl emphasizes the importance of having felt like a person throughout the treatment. 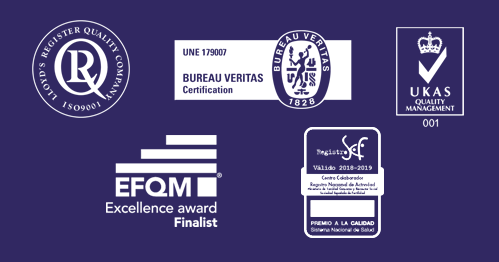 She has no words to thank the work of Dr. Marbán and Dr. Santiago, who were involved to the maximum and with their understanding and professionalism accompanied them even in the hardest moments. Cheryl affirms that what she had with them was more than a doctor-patient relationship. “It was when we needed the most help that we received the most support,” she says in her testimony. Now, four months after her son, Luca, was born, she couldn’t be happier. She thinks daily about everything she has gone through to get here and thanks the clinic team and the donor for having a family today. “Being a mother is a wonderful experience, a wonderful feeling, even when he cries,” she confesses with laughter looking at her baby. 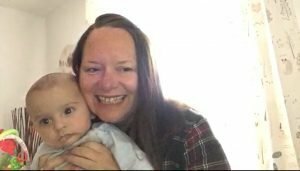 What this mother advises everyone who wants to start a family is not to wait to start their treatment, because even though it is a long process, it is very worthwhile. For Cheryl, the clinic choice is crucial because she says that what was going to happen there was going to be part of her family and her life. She advocated choosing not only the one that had a good reputation but the one that dictated her instinct. At Clinica Tambre she felt safe and supported. Finally, the advice that Cheryl wants to share with all those who want to start a family is that they follow their dream, that they don’t give up because even though it gets hard and difficult, in the end it gets done. This young couple tells us about their hard journey to become parents. Andrea and Fran are the protagonists of this beautiful but sad story with a happy ending. Despite their young age (23 years), they already had to face one of those situations, that you think will never happen to you. A lot of strength, a lot of mutual support, a lot of love and a lot of positivity is what has made this young couple overcome one of those nightmares that life throws at you. Once they had overcome this horrible time of their lives, with all the recovery process that entails, their main objective was not to leave behind their dream of forming a family. In his case, the only option was an egg donation treatment, something that created a lot of doubts, which our experts did not hesitate to solve. Although at the beginning it seemed “shocking” to have a baby by this method due to the fact that it did not carry her genes. But Andrea decided to take advantage of the opportunity to be able to experience the pregnancy and give birth to the baby herself. When they received the news that their pregnancy test was more than positive, the happiness they experienced made them forget all the hard times they had gone through and all the doubts that had, so they could focus on the great gift that life was giving them. Stories like this one show clearly that no matter how difficult the situation is, usually there is a solution for everything. They only had to accept the fact that for them the happy ending took a little longer to arrive. But despite everything, they have been able to fulfill their dream of becoming parents at a young age. As Fran says, the important thing is to support each other and being there for your partner and “when we started to realise what was happening, we were already holding our baby in our arms”. 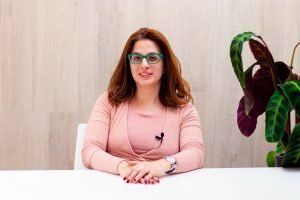 Elena is an ophthalmologist and, as a doctor, she knows very well that it is better safe than sorry, and that is why she has not hesitated about preserving her fertility in Clínica Tambre Madrid. Elena Santiago is an ophthalmologist and, as a doctor, she thinks that it is better safe than sorry. In this video she explains why it is better to anticipate possible health problems than finding a solution in the future. She is clear on this and recommends every woman to do everything that is possible to prevent an infertility problem in the moment they desire to become mothers. Elena points out that fertility treatments are a taboo topic in our society and we should talk more about them. In the video she claims that women should be able to access more information about the options they have within reproductive medicine and the state of their fertility. “They will be able to make adequate decisions with more information”. Elena confesses that she is now more confident and relaxed thanks to the egg freezing treatment. She always knew that she wants to be a mother, but time flies and she has not find the right moment. That is why she thought that the best solution was to preserve her fertility in Clínica Tambre. Do you want more information about this treatment? Click here to know more about fertility preservation. “I help other people accomplish their dream of becoming parents as they helped my parents back in the day”. She is Miriam. She is 28 years old, she was born in Lorca (Murcia) and she is an embryologist. This description may not seem like the description of a protagonist of a novel, but it hides an amazing story. Her testimony is one of those that touch you. But, especially, it makes you think about the twists of fate, about its unavoidable power that leads our lives towards the correct path, about its way of letting us know that coincidences do not exist and that everything has a reason. 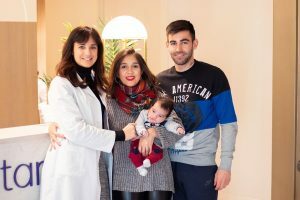 “My mother had fertility problems when she was 25, but she ran into Pedro Caballero, Clínica Tambre’s founder, and Rocío Nuñez, the embryologist that processed the samples back then. They gave my parents the opportunity to have a child. So, without any doubt, they packed their suitcases and came to Madrid, with their hopes set on us. And, here we are! After some attempts, they received the happiest news: she was pregnant”, explains Miriam Sánchez in this video. It was very “special” to Miriam to know that she had been born thanks to assisted reproduction. It made her “feel different”. Is that what planted the seed of her inquisitiveness and passion for embryology? Miriam answers that question in the video and she reveals the “coincidence” that makes her story unique. She defines herself as an “endangered species” because she is the consequence of a treatment that led to triplets. That is why Miriam is so interested in the technological progress of this field. She explains that the techniques and treatments used in assisted reproduction have improved very quickly and nowadays “it is almost impossible to become pregnant with more than one embryo”. 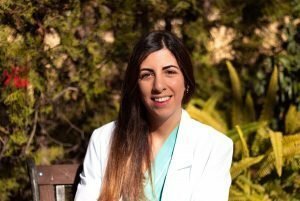 Today, Miriam is very passionate about embryology: “For me, embryology is the possibility to create life and help people who have had fertility problems like my parents to accomplish their dreams. I feel that I have to help these people because my parents received the same help back in the day”. Find out the story of Sandra, who have preserved her fertility at Clínica Tambre.